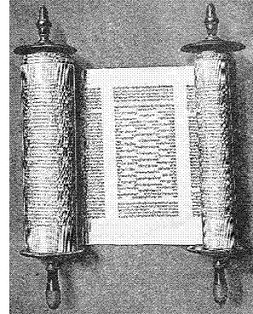 The Torah - It is the ultimate authority within the Jewish faith. It guides Jews through life from beginning to end. Etymologically, it means "teachings", not "law" as it is commonly referred to. And the body of the Torah can vary in size depending on how strict one defines it. In its broadest sense, it can mean the entire work of Jewish teachings, including the Hebrew Bible (Old Testament), Talmud, Midrash, et al. More narrowly, it may refer to just the Hebrew Bible, which Jews call Tanakh. And most narrowly, it may consist of nothing more than the five books of Moses, or the Pentateuch. For it all began with Moses, who spoke directly with God; and therefore, the Pentateuch is considered the embodiment of God's word. And as such, is God's will for man. Historically, it is one of the oldest documents of faith on earth. Ancient Hebrew, the language of the Torah, is a Semitic language, related to Aramaic, which supplanted Hebrew after the exile.